Star Wolf is set in a future where man inhabits the stars. The empire of Humaniti consists of several different nations with different theological stances. One is atheist, and two espouse Christianity but have different approaches to the Bible. In this book, Christians are both heroes and villains, with interesting results. There are also several alien races in the neighborhood- the Angelicum and Daemoni, alien races that humanity originally knew as angels and demons, the Prophane (vampire-like humanoids), the Fei (blue skinned elf like creatures), the Lubanians (wolf like creatures) and the Draconi (dragon- like creatures). in this book, christians are both heroes and villains, with interesting results. As the book opens, human Dr.John Salzmann, is being tortured by another human and is rescued by Lubanian Molon Hawkins, captain of the mercenary ship Star Wolf. Molon takes John back to his ship, but they have difficulty locating the anonymous customer so that the crew of the Star Wolf can get paid. A mysterious adventure ensues- who is the customer that hired the Star Wolf? What was the real reason that Dr. Salzmann was taken? Is Dr. Salzmann’s wife, Dr. Elena Salzmann, still alive? The characters are multi-dimensional as well. John, now a teetotaling member of the Faithful, was once an alcoholic. Voide, the Prophane crew member, was raised by human parents, and for that crime is hated by her own people. Molon was raised by Faithful human parents, and struggles with whether or not he, too will be one. This book had wonderful worldbuilding and character development, but I did find it disconcerting that although Molon is the character pictured on the front of the book, the book is written from John’s point of view. Occasionally John seems to function as a Dr. Watson for the reader, asking questions that the reader might like to know. That worked well for Sherlock Holmes, but I’m not sure that it works as well in this book. There also seemed to be excessive worldbuilding details (details unrelated to the plot) and occasionally they slowed down the pace. The characters spent a lot of time in space having fights (which were well choreographed), but I think I would have liked to explore the interesting civilizations more. My objections were minor, and I felt that the inventive and well executed worldbuilding more than made up for them. I think fans of military science fiction and those who liked softer military sci fi (Star Wars, Star Trek) will enjoy this. I’m looking forward to the sequel! Heat: There is very mild flirting, and in one scene a woman brushes her hand against a man’s chest suggestively. Violence: There is action movie style violence, but the author takes care to avoid gory or gratuitous violence. Cost Today: 2.99 on Kindle. 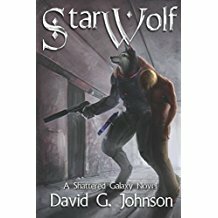 Disclaimer: I received a free copy of Star Wolf from the author with a request for an unbiased review.